Lepisma saccharina, frequently called a silverfish or fishmoth is a small, wingless insect in the order Thysanura. Its common name derives from the animal's silvery light grey and blue colour, combined with the fish-like appearance of its movements, while the scientific name indicates the silverfish's diet of carbohydrates such as sugar or starches. Silverfish are nocturnal, elongated and flattened insects typically 13-25mm long. Their abdomens taper at the end, giving them a fish-like appearance. The newly hatched are whitish, but develop a greyish hue and metallic shine as they get older. They have three long cerci at the tips of their abdomens, one off the end of their body, one facing left, and one facing right. They also have two small compound eyes, despite other members of Thysanura being completely eyeless, such as the family Nicoletiidae. Silverfish are a cosmopolitan species, found in Africa, America, Europe, Australia, Asia and other parts of the Pacific. They inhabit moist areas, requiring a relative humidity between 75% and 95%. In urban areas, they can be found in basements, bathrooms, garages, closets, and attics. The female lays groups of less than sixty eggs at once, deposited in small crevices. The eggs are oval-shaped, whitish, about 0.8 millimetres (0.031 in) long, and take between two weeks and two months to hatch. Silverfish usually lay fewer than one hundred eggs in their lifetime. When the nymphs hatch, they are whitish in colour, and look like smaller adults. 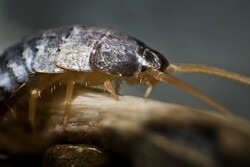 As they moult, young silverfish develop a greyish appearance and a metallic shine, eventually becoming adults after three months to three years. They may go through seventeen to sixty-six moults in their lifetime, sometimes thirty in a single year, which is much more than usual for an insect. Silverfish are among the few types of insect that continue to moult after reaching adulthood. Silverfish are considered a household pest, due to their consumption and destruction of property. Knott's can help you control your silverfish problem and protect your precious books, photo albums and other memorabilia!